Few stories have such cultural traction in young hearts and minds as The Wizard of Oz does, and few cultural institutions gets so much so right about what interests young people as does Young People’s Theatre. So it makes perfect sense that during their silver anniversary season (50 years! ), YPT tackle the venerable, delightful tale of a young person who dreams vividly of a different life. It’s obvious even before the production opens that this Wizard of Oz will hit YPT’s usual high standard. For one thing, I was pleased to note that it features a refreshingly diverse cast (in a city that lives very multicultural but continues to cast remarkably white). Artistic Director Allen MacInnis – asked to talk about why YPT manages to hit this mark so consistently – responded via email: “Unfortunately, in the world of casting there is still a strong tendency to assume, unless told otherwise, that a character in a play, movie, commercial or TV show is white. At YPT, we have been resisting this assumption for most of our 50 years of existence.” MacInnis’ concise calling-out of the problem makes it rather clear where this commitment comes from in the most satisfying way. This The Wizard of Oz will also, excitingly feature a lost (now restored) rarely-seen musical number that was cut from the original film: The Jitterbug. Evidently there was some concern, when the movie was being edited, that the song (musically quite contemporary) would “place” the movie in the wrong time period and rob it of the timeless quality the film studio hoped for. The song was cut, and most fans have never heard it, but this production will be bringing it back. Musically, there will also be a fiddle and banjo duo onstage with the cast, interpreting many of the classic songs and providing atmospheric music under the direction of the marvelous Reza Jacobs. It may represent a departure from the round orchestrals Judy Garland made famous, but it seems there are all manner of newnesses to this production. 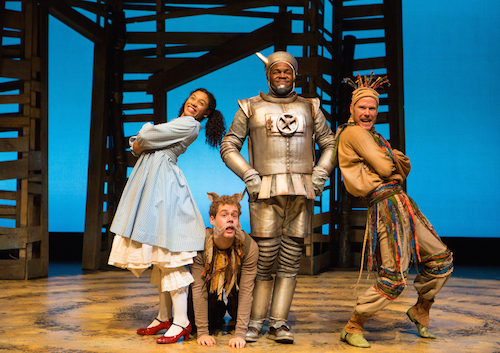 There’s a great deal to look forward to in this new The Wizard of Oz, and one more tidbit we at Mooney on Theatre can share: kids may enjoy trying to see how many objects they can spot during the scenes in Oz that look a whole lot like things from Dorothy’s Kansas home. Public matinees are Saturday and Sunday at 11am and 2:30pm, with a few 7pm performances. Tickets range in price from $10 – $45.